Douglas Max Utter’s first painting in oils at the age of 10 provided a fitting launch for a lifetime as an artist. Oxford was painted in 1960 when his father, a noted biochemist at Western Reserve University, was doing research for a year at New College in Oxford, England. An artist named Mary Oliver, who was a neighbor living nearby in suburban Oxford, was also a member of the Royal Academy. She offered to guide Douglas and provide materials as he painted a view from her garden. “I’ve never stopped painting since that day,” Doug remarks. The family traveled in Europe that year, where the young artist visited major museums in Paris, Amsterdam, Florence, and Rome. Later, back at home in Cleveland, there were frequent trips to the collections at CMA. And there were other journeys, to Washington and New York and back to England. “A lot of my paintings were of ships and landscapes and traveling,” Doug remembers. 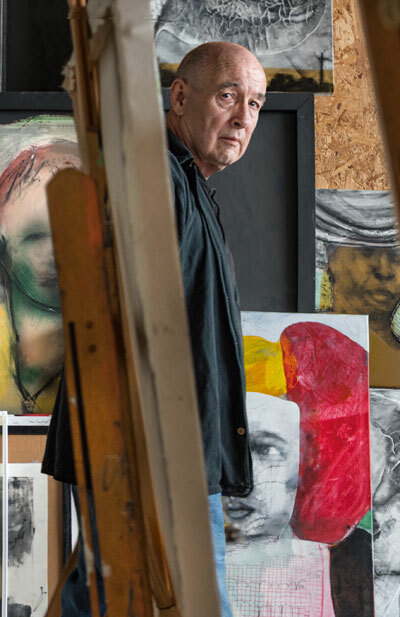 “My work had to do with life events, and with the idea of displacements of the self and changing points of view.” Although his parents hired a recent graduate of the Cleveland Institute of Art to tutor Doug, and enrolled him in art classes at CIA and the Cleveland Museum of Art, he never again formally studied art. Instead, he threw himself into studying comparative mythology and literature – devouring Dostoyevsky’s works at 13 – and classical languages. While attending Cleveland Heights High School, he taught himself New Testament Greek. In the wake of his father’s sudden death in 1980, Utter’s life changed dramatically. He soon married sculptor Lori Hyler, and their two children Christopher and Elizabeth were born before the end of the decade. Utter worked as an independent furniture refinisher, while continuing to paint in a basement studio. As his life expanded during this pivotal time, so did his interests. Mid twentieth century painters and the postmodern movements of the 1970’s and 1980’s began to influence his manner, and new experiences and persons found their way into ambitious figurative compositions. Friend and fellow painter Amy Casey (2009 Cleveland Arts Prize winner) says she likes the way he strips his subjects down to essentials, making them larger than life. “In the best of his works, he can take the most ordinary people, gestures and events from his life, even the weather, and transform them into something mythical,” she says. In 1989 Doug began a second career in the arts as an insightful art critic, and has since published more than 400 articles and reviews in Ohio and national publications. Throughout his painting career, he has had more than 40 solo and 150 group exhibitions, including several shows in New York, and his work has been awarded three OAC fellowships as well as a CWF in 2011. He won the “Best of Show Award” in the 1987 May Show at CMA. Additionally, his work has been reviewed in Art in America, New Art Examiner and The Plain Dealer and other magazines and newspapers Fred + Laura Bidwell around the country. In Cleveland, he is represented by the William Busta Gallery, and his newest paintings are featured in a show at Survival Kit Gallery this month.